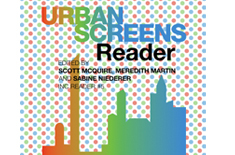 In the final session of the conference, Sabine Niederer presented the launch of the first book dedicated entirely to the urban screens theme, The Urban Screens Reader. The book was edited by Scott McQuire and Meredith Martin from the University of Melbourne and Sabine Niederer from the Institute of Network Cultures. The Urban Screens Reader contains three sections: ‘Urban Screens: History, Technology, Politics’, ‘Sites’, and ‘Publics and Participation: Interactivity, Sociability and Strategies in Locative Media.’ The book in pdf will be soon available for free download on the INC website. The Urban Screens conference which took place in Amsterdam on the 4th of December this year is the fourth in a series of events which has been organized around the theme of display screens (LED signs, plasma screens, projection boards, intelligent architectural surfaces, etc.) in urban spaces. It supports the idea of using public space as a platform for creation and cultural exchange, strengthening the local economy and encouraging public discussion. Since the first Urban Screens event in 2005 in Amsterdam, related international conferences have taken place in Manchester in 2007 and Melbourne in 2008. The series of events encourages the exploration of opportunities to employ the growing infrastructure of large digital displays in public space currently used mainly as a tool to influence consumer behavior through advertising, and expand them by displaying cultural and artistic content with the purpose of revitalizing public space, and generating public engagement and interaction. Paul Klotz is an applied art engineer and light designer who specializes in interactive light installations for public spaces. By means of light and sound installations which create a feedback loops between the passerby and the installation upon physical interaction with the artwork, he attempts to set up in public spaces artistic zones which captivate, entertain and enrich human experience. The Tunnel Vision installation for example is a light and sound installation which responds to the individual’s hand movements within it by sound and light alterations. Theo Watson: Start Your Own Graffiti Research Lab! Theo Watson is one of the members of Graffiti Research Lab, an art group which brings together hacking and graffiti writing into digital graffiti as a form of communication in urban spaces. The organization is based in New York and now has other nodes Mexico, Vienna, and Amsterdam, where Theo is located. This does not make digital graffiti accessible to anyone however because a certain level of practical understanding of the technology is necessary to operate and adapt the tools. The pratice is more of a ‘geek’ – oriented graffiti, to use the words of one of the founders of the group, Evan Roth. Moreover, the high prices of acquisition for some of the equipment, such as the projectors, which can get to 7000 euros, make them still inaccessible to many. Mettina Veenstra is principal researcher and coordinator of the theme public screens at Novay Research. Novay is a Dutch research institute for ICT driven innovation. Her presentation at the Urban Screens conference in Amsterdam on the 4th of December this year focused on what public displays can do for public space in terms of stimulating encounters and interactions between people in public spaces. They envision the role of public digital displays as external stimuli for encouraging contact between people, with art being an important type of stimulus. But why is it important to foster social interactions? According to Mettina Veenstra social interactions lead to social capital which is important for our well being and our economy. The speaker identified eight functions of public displays: information, entertainment, art and culture, advertising, communication, better services, e-participation (the stimulation of discussion on environment and other local issues) and influencing (colors or imagines that can improve the mood of people). The speaker presented a series of projects for public screens which incorporate these functions and ideally aim to generate social capital. For example, a game projected in neighborhood public digital displays, the main target audience of which are youngsters, permits any individual who owns a mobile phone to play with the main character of the game, a dog, along with other people who access the game trough their mobile phones. A social networking site which links you to people whom you played the game with has also been set up. Other projects aim at encouraging the practice of performing arts in public spaces, while others are designed for public areas of office spaces with the purpose of stimulating workers to get in touch with each other by means of a constant flow of messages related to their activity. The ‘recipe’ for fostering social capital which Novay puts in practice emphasizes the ‘locality’ of content and it’s direct relevance to the individual (personalized content), as well as allowing people to interact with the screens. The personalization of content is enabled by the integration of sensors and facial recognition technology in context aware applications. This year’s Urban Screens conference in Amsterdam focused less on theoretical aspects and more on showing some of the actual artistic and non-commercial projects and installations which have been developed for digital displays in public space, and Mettina Veenstra’s presentation was one of them. I could not help noticing with surprise the great gap between theory and practice in what producing applications and installations for digital interfaces in public space as platforms for creation, cultural exchange and social interaction are concerned. While the growing number of such projects is certainly a step in the right direction, an issue that deserves more attention is a more informed and critical integration of new technologies, such as surveillance technologies, in these projects. For ambient intelligence enthusiasts, a recent exhibition which took place in New York, The Sentient City, provides a useful source for reflection. The Too Smart City section of the exhibition contained a series of artworks which amusingly explored potential technological failures of augmented objects, as a way to generate reflection about the transformations and effects of living in an intelligent urban environment. Another concept which has been extensively and uncritically used today in the presentations with implicit positive and ideological connotations directly related to the applications’ potential to foster social change is the concept of ‘interaction’ in relation to media applications. However, interaction with digital environments is often not the much celebrated ’empowerment’ of the individual now an user/participant, to replace the passive consumption of traditional media, but simply reaction and individual configuration of a technological environment with a limited number of already defined potential paths. Moreover, the participant’s agency in artistic environments is not meaningful in itself in relation to social change but only when it “sets empathy in motion toward responsible interaction and constructive change.” (Stiles and Shanken, forthcoming: 93). I am convinced that The Urban Screens Reader which has been launched today and which will soon be available for free download on the INC website, will be an useful tool in bridging the gap between theory and practice. Kristine Stiles and Edward A. Shanken, Missing in Action: Agency and Meaning in Interactive Art, forthcoming in Margot Lovejoy, Christiane Paul, Victoria Vesna, eds., Context Providers: Context and Meaning in Digital Art (University of Minnesota Press).